I’m finding it strangely difficult to bring myself to write when the sights and sounds of this week are still so resonant. This may seem odd, given that it was fellow writers, putting their opinions into the public domain that apparently sparked these events of evil. Words seem so futile. And there are so many words that have been written and spoken regarding the events in Paris it seems that everything has been said. So I will talk of that which was not written. In London, as we journeyed forward to New Year’s Eve, there was a sense that 2014 was a year we were all going to be glad to see the back of. Amongst my friends we talked of the relief at seeing out an awful year for Jews (as Queen Elizabeth once declared, an “annus horribilis”). We saw antisemitism reaching new highs, the conflict in Israel and Gaza in the summer and the attacks in Jerusalem and Tel Aviv later in the year. The fireworks over the Thames at midnight and the strains of Auld Lang Syne seemed to offer new hope and comfort for 2015. Also, for many of us here in the UK, it would also be an opportunity for us to look back at 2014 and say, “we made a difference”; “we made a stand”; “we found our voice”; “we changed for the better”. But whilst we felt we made a change, the calendar rolled over into the first days of January, we sadly discovered that the world hadn’t. Plus ca change, plus c’est la meme chose (the more things change, the more things stay the same). Just before New Year, I wrote to HarperCollins about a World Atlas that they produced for their Arabic market. This atlas was designed in English for Arabic students as a reference book. In it one reference that was not apparent was Israel. Israel had been removed. The land mass was there, Gaza was there, Jordan was there, but no Israel. Once I had informed the CEO of the situation, HarperCollins, within a couple of hours, confirmed to me that they would be removing the product from sale and all remaining stock would be pulped. HarperCollins made a full apology. But the reasoning behind the original strategy revealed a sinister message. Their reasoning for the removal of the State of Israel was, according to the company’s representatives, that their customers would have found the inclusion of Israel “unacceptable” so the Atlas was amended for “local preferences”. In the wake of the Charlie Hebdo attack, many journalists and publishers in the UK immediately stood up and said that they would not kowtow to the terrorist threats of extremists. Free speech was everything. There was a certain sense of righteousness that the media would now not fear delivering the story with any censorship. We would all see what the commotion was about, why 12 people had been murdered for free speech. We would not see OUR press cower in fear. Yet the morning after the murders of these cartoonists, exactly as their editor, Stephane Charbonier had predicted but had hoped would not be the case, the press stood down. Stephane himself had said he would rather “die standing”. Not one British newspaper, not one TV channel was prepared to publish or show these cartoons. Some spoke bravely (such as Andrew Neill and David Aaronovich), but otherwise they all hid behind the “insensitivity” of publishing those satirical cartoons. This fear of offence has become a wider topic now here in the UK, yet we are still no closer to addressing it. It feels for many that the extremists have won. Jonathan Glass epitomized the feeling of many when he wrote imploring The Independent, an ambitious and usually brave broadsheet, to do the right thing. He said “all organs of the media must resist the assault on free speech”. And further, “If only our journalistic elite had the same concern about standing up for what is right”. But no…. During these awful events, one fact is rarely being uttered. You see, if it were, it might cause us to think the worst. The French exodus. Here’s a very brief letter summarising the situation which I sent to The Independent, as a reminder of the situation the French Jews find themselves in. Regular attacks on religious establishments and amenities, physical attacks on those going about their daily lives, terror, threat and murder. 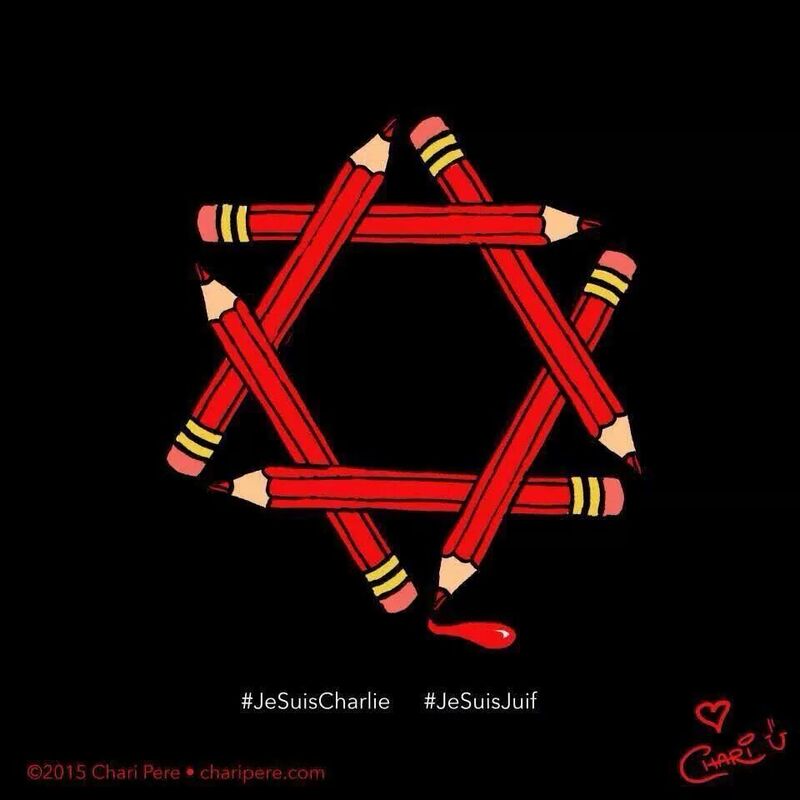 Jews are victims in France daily. And the perpetrators are always the same. Jews in France are leaving in their droves. 20% of French Jews have fled France in the last 2 years (100,000 emigrated from France to Britain, US and Israel). France will be Judenfrei before 2020 thanks to the Islamic terror campaign and the inertia of successive governments. This campaign achieving what even the Nazis failed to do, rid France of Jews. In Europe, we are sleepwalking into a catastrophe. Wake up Europe before it’s too late. “Not in my name”. This is the rhetoric spoken by many Muslim leaders. These leaders seem to be decent and caring people. They are genuinely concerned and as outraged as the next man. Yet, “not in my name” doesn’t help. It distances Islam from the extremists and hopes that they’ll go away by denying they exist within the boundaries of the faith. These radicals, these terrorists, these extremists are doing these egregious acts in the name of Islam. And rather than saying “not in my name”, Muslims need to come out and say what their name is. When I see tens of thousands of Muslims protesting against their brothers, marching on Westminster saying “Muslims against Jihad”, “Muslims against apostasy”, “Muslims want freedom of speech” and “Muslims for British values” and so on then I will start to believe. This is what is not spoken. Unfortunately, with the exception of Paris this weekend, the only time we witness the outpouring of emotion is when global brothers are offended and not when others outside of their faith are. Where are the Keffiyeh clad protest marches for the Christians of Yazidi, the Israelis murdered in Jerusalem, the children of Nigeria, the slaughtered refugees of Sudan and even the victims of genocidal war of Syria? Muslim leaders must be brave. They must take ownership of Islamic terror. They must put their arms around it and smother it with love and saturate it with good not evil. Start this in the schools, continue it in the mosques and send it out into the world. Prove that Islam is a religion of love not war. Shunning the terror, ignoring it, excusing it, will just make it breed and prosper. There is a tradition at midnight on New Year’s Eve of singing an old poem by the Scottish bard, Rabbie Burns (not to be confused with the Rabbi Burns). We sing “For the sake of Auld Lang Syne”, it means “for the sake of old times”. We sing it to reminisce for the good old times and we wish for more of the same. This year let us hope, despite the dreadful start, that we can put the bad times behind us and enjoy more of the good ones. 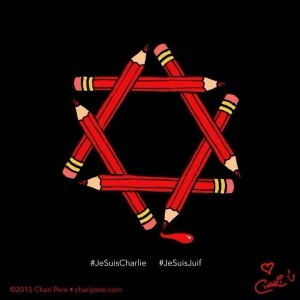 This entry was posted in Uncategorized and tagged Anti Semitism, Charlie Hebdo, Jewish, Paris, Terrorism on January 12, 2015 by admin.